Giotto Bizzarrini (6 June 1926 in Quercianella, Livorno Province, Italy) is an Italian automobile engineer active from the 1950s through the 1970s. Bizzarrini was chief engineer at Ferrari in the 1950s, working on such notable projects as the Ferrari 250 GTO. He split from the company in a major upheaval in 1961, worked first with ATS, and then in 1962 started his own company, Società Autostar, whose name was changed to Bizzarrini in 1964. Bizzarini also worked for other makers including Iso, Lamborghini, and Alfa Romeo. Several concept cars in the 2000s bear his name. Bizzarrini was the son of a rich landowner from Livorno. His grandfather, also named Giotto Bizzarrini, was a biologist who had worked with Guglielmo Marconi on his inventions, especially the radio, following which one of the Livorno Library sections was named The Bizzarrini Library. Bizzarrini received an engineering degree from the University of Pisa in 1953. His design thesis in his senior year was a complete redesign of a used Fiat Topolino, in which he modified the engine for increased power and relocated it in the chassis for improved handling. After graduation, he taught briefly before joining Alfa Romeo's 'Servizio Esperimenze Principali' unit under Ing. Nicolis in August 1954. He was assigned to the development of the Alfa Romeo Giulietta chassis, which was disappointing, as he aspired to become a powerplant engineer. He was later able to move to the Experimental Department, receiving on-the-job training to become a test driver: "I became a test driver who coincidentally was also an engineer, with mathematical principles. I always needed to know why something fails, so I can invent a solution." Bizzarrini left Alfa Romeo in 1957 and went to Ferrari when that company needed a test driver. He was quickly promoted to controller of experimental, Sports and GT car development. Some legends refers Mr. Ferrari when he saw Bizzarrini's first car, a Topolino based special called The Macchinetta, he said "A man able to build and drive that car, must work for Ferrari". He worked five years at Ferrari as chief engineer. He also worked as developer, designer and skilled test driver. 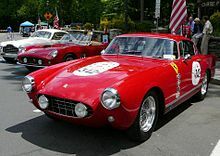 The Ferrari 250 GT 2+2/GTE, the 3 litre Testa Rossa V12 engine, the Ferrari 250 TR or Testa Rossa and the Ferrari 250 GT SWB (Short Wheelsbase Berlinetta or Berlinetta Passo Corto) were influenced by his ideas and technical solutions. For one of the most successful Ferrari racing series, the Ferrari 250, Bizzarrini worked hard to develop the chassis, engines and advanced dynamic solutions. His masterpiece at Ferrari was the 1962 Ferrari 250 GTO. He was first involved with the 250 GTO project in 1960. Ferrari wanted a GT racer with better aerodynamics than the previous 250 GT SWB. The SWB was a great racer but had considerable aerodynamic drag. Jaguar had just launched the Jaguar E-Type and Ferrari needed a top contender in the tracks, and Enzo Ferrari wanted to ensure that his racing team did not suffer another loss as it had in the 1959 LeMans race. Tests started secretly with a Ferrari 250 GT unit, bodied by Mario Boano, with chassis number #2643GT, Bizzarrini's personal car. This car was developed and was used as a test mule for technical solutions later seen in the GTO. This car was known as the Bizzarrini Ugly Duck (he said, "We dubbed the car 'Il Monstro'".) Experiments with the SWB chassis indicated the considerable speed loss due to aerodynamic drag, so Bizzarrini reduced the frontal area and increased the bonnet length, both to reduce drag and reduce front lift tendency at high speeds. Bizzarrini moved the engine well back into the chassis and lowered it (by using a dry sump lubrication system) to improve weight distribution and handling. The result was the Ferrari 250 GTO, one of the greatest sport cars ever. In 1962, when the GTO was launched, it was the ultimate in aerodynamics. Carroll Shelby's 289 AC Cobra cars had an advantage on slow tracks, but the GTO achieved a superior top speed and dominated the GT class. In 1961, Bizzarrini was one of the "famous five" engineers who left Ferrari. This is known as the "Ferrari night of the Long Knives" . It was caused because Ferrari wanted to reorganise the engineering staff. Bizzarrini left Ferrari and founded with other ex-Ferrari engineers (Carlo Chiti and others) the company Automobili Turismo e Sport (known as ATS) to build a Formula 1 single seater and a GT sport car, the ATS Serenissima. In 1962, Bizzarrini was hired by Count Giovanni Volpi, owner of the SSS, Scuderia Serenissima Republica di Venezia, to upgrade a Ferrari 250 GT SWB with chassis number #2819GT to GTO Specification. Ferrari was upset with Volpi and refused to sell him a GTO, so they had to acquire and modify a used vehicle. Ferrari 250GT Drogo #2819GT "Breadvan"
Bizzarrini applied all the ideas from the GTO and developed with Piero Drogo of Carrozzeria Sports Cars in the Modena works an aerodynamically advanced body, even lower than the GTO, with the roof line dramatically extended to the rear end, then abruptly truncated following the Kamm aerodynamic theory. The car was completed in just 14 days. The mechanicals were extensively reformed and the engine set well back into the chassis and lowered, using dry-sump lubrication. This car, chassis number #2819GT was called the Ferrari Breadvan, and is currently raced in vintage Sport Car events. The car was raced at the time with some success, with Carlo Abate and other drivers at the wheel, but could not beat the GTOs because it still had only a four-speed gearbox. At least another two 250GT series cars were developed by Bizzarrini, Piero Drogo and teammates Neri and Bonacini to GTO specifications and received distinctive bodies with similar advanced shapes. In 1962 Bizzarrini founded Società Autostar, an engineering firm through which he would bid for freelance engineering projects. Ferruccio Lamborghini commissioned Società Autostar to design an engine for his new GT cars. The engine was first shown in the Lamborghini 350GTV prototype in 1963 and was first manufactured for use in the 350GT in 1964. Variations of the basic design have been used in every V-12 Lamborghini until 2010. Originally displacing 3,464 cc (211 cu in) in the 350GT, it had been increased in displacement to 6,496 cc (396 cu in) in the final version of the Murciélago. Società Autostar developed cars for Iso Autoveicoli S.p.A. including the Iso Rivolta IR300 and the Iso Grifo. A dispute between Bizzarrini and Iso ended their collaboration, and led to Società Autostar building variants of the Iso Grifo under the Bizzarrini marque. This led Bizzarrini to change the name of Società Autostar first, in 1964, to Società Prototipi Bizzarrini and then in 1966 to Bizzarrini SpA. The Società Prototipi Bizzarrini was declared bankrupt in 1969, which ended Bizzarrini's days as an automobile manufacturer. Bizzarrini SpA also developed advanced designs for other companies, including American Motors for which they built prototypes for the AMX/3 project, and as style and technical consultant for GM in Europe and USA, top Japanese motorcycle marques and well-known designers such as Pininfarina. Bizzarrini is still busy with personal projects and conferences. At the 2005 Geneva show, the new owner of the marque Bizzarrini showed the new GT Strada 4.1 concept, a two-door GT with a 4.1-litre 550 bhp (410 kW; 558 PS) plant (maximum speed - 360 km/h (220 mph), 0–100 km/h in 3.8 sec.) which was planned for production in 2007. Giotto Bizzarrini teaches and works with Rome University, developing advanced projects and designing, building and developing his own sport cars. He has often said: "I'm not a car designer, I am a worker". On October 23, 2012, the occasion of the inauguration of the University of Florence new Design Campus in Calenzano Professor Giotto Bizzarrini was given the Honoris Causa Degree in Industrial Design. "Giotto Bizzarrini: Engineering Excellence". autoevolution. Retrieved 2009-05-16. Ferrari 250 GT SWB Drogo also known as the "Breadvan"